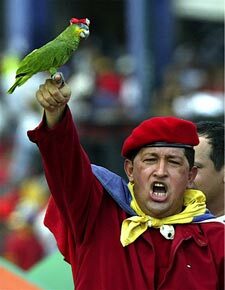 Hugo Rafael Chavez Frias was born on 28. 06. 1954. inSabaneta, Venezuela, a small village located in the western state of Barinas. Young Hugo Rafael Chavez Frias escaped a life of poverty thanks to his skill as a baseball player. Baseball is the leading sport in Venezuela.As the leader of the Bolivarian Revolution, Hugo Rafael Chavez Frias promotes a political doctrine of participatory democracy, socialism and Latin American and Caribbean cooperation. He is also a critic of neoliberalism, globalization, and United Statesforeign policy. He has promoted ideas of socialism, participatory democracy and Latin American and Caribbean cooperation. Ch�vez is a controversial figure at home and abroad. Detractors within the Organization of American States, European Union, United Nations, U.S. State Department, and others, criticize Ch�vez for alleged human rights violations, while supporters point to improvements in constitutional and legal rights, poverty reduction, health care, women's rights, and the treatment ofindigenous peoples under his presidency. His political influence in South America � partly due to his government's use of Venezuela's oil wealth � and his sometimes strained relationship with the United States endow him with a high geopolitical profile, leading Time magazine to include him among their list of the world's 100 most influential people in 2005 and 2006.